February 24, 2019 at 9:55 am. 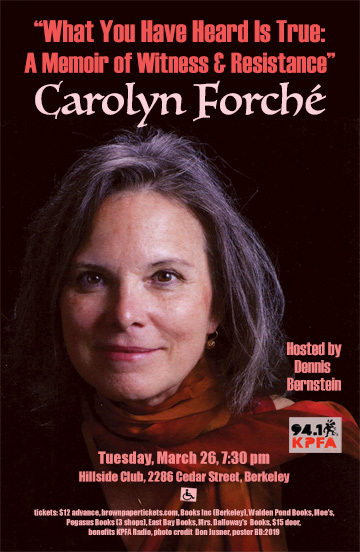 Carolyn Forché is one of the most gifted poets of her generation. Her work—including Blue Hour, The Angel of History, The Country Between Us, and Gathering the Tribes—has been translated into more than twenty languages. She has received the Windham-Campbell Prize and the Academy of American Poets Fellowship. For decades the story of how Carolyn became an effective activist has not been told. At last, in her shimmering, gripping prose, we learn how a fateful encounter and a radical act of empathy changed the course of her life. Carolyn was twenty-seven when a mysterious stranger appeared on her doorstep— a charming polymath with a mind as seemingly disordered as it was brilliant. She’d heard rumors about who he might be: a lone wolf, a communist, a CIA operative, a sharpshooter, a revolutionary, a coffee farmer…He had driven from El Salvador to invite her to his country. Captivated, she accepted and became enmeshed in something beyond her comprehension; they meet with high-ranking military officers, impoverished farm workers, and clergy desperately trying to assist the poor and keep the peace. These encounters are a part of his plan to educate her. As priests and farm-workers are murdered and protest marches attacked, Carolyn is swept up in his work and in the lives of his friends. Pursued by death squads, sheltering in safe houses, the two forge a rich friendship as she attempts to make sense of what she’s experiencing and establish a moral foothold amidst profound suffering. She learns how she can act as a witness and translate that into an art that might illumine the lives of others. That is “the poetry of witness,” and she has proven to be one of North America’s rare practitioners.